Have you ever owned a valuable piece of art, a vintage poster, a large map or even something like an antique atlas or an official land survey map? These things have one major thing in common – they are all large format documents that can be quite challenging to handle, preserve or use. This is why large format document scanning solutions are such a tremendous boon. 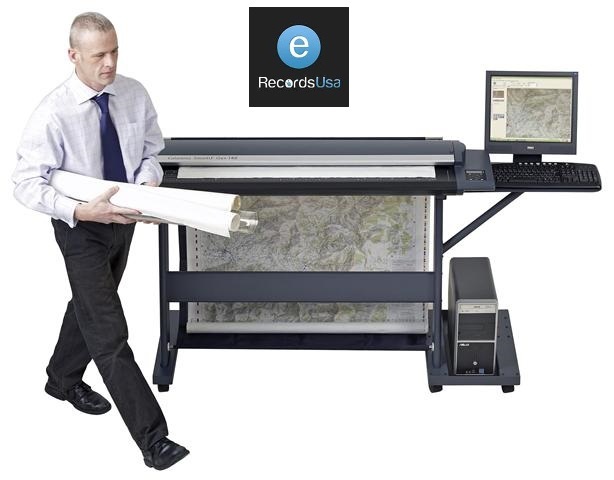 At eRecordsUSA you can find an array of large format document scanning solutions that can address a diversity of needs. Just consider, you might be in possession of fragile maps and documents that folding and unfolding damage. Yet, you might also need the data those maps or documents contain. Rather than further jeopardizing them, the use of a large or wide format scanning solution is the answer. It turns that delicate or fragile item into a fully searchable and easy to read digital file. If you need a full-sized print in the future, that file will make it entirely possible. While wider format documents are not always fragile, they are always challenging to manage and even to store. Stacks of rolled up tubes of paper or enormous file cabinets of open documents are cumbersome at best and spatial hogs at their worst. Managing them, retrieving them, and using them can be extraordinarily challenging. Imagine the joys of just typing in a file name and watching that document pop up on the screen. Why compromise the stability and longevity of any oversized document. Whether it is an everyday document such as a land map or a historical item or piece of art, the use of large format scanning is the answer. Preserve and protect the originals while enjoying the full use of a searchable and full-scale file from your secure online storage. Get in touch to learn more! eRecordsUSA is also specialized in providing Document Scanning Service, Document Imaging Service, Large Format Scanning Service, Large Format Document Scanning Service, Large Format Blueprint Scanning Service, Large Format Document Digitizing Service and more. Would you like to receive a free quote for Large Format Document Scanning Solutions? Call +1.855.722.6669 or eMail us at info@eRecordsUSA.com.